September 5, 2012 | 4:33 p.m.
New student welcome activities included a Minnesota Twins game. 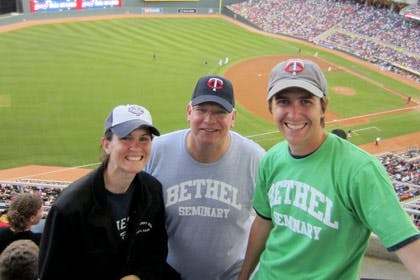 Bethel Seminary held its first-ever New Student Welcome event in mid-August, welcoming 46 students and guests from Minnesota, Iowa, and Missouri who were joined by 12 faculty and staff members. The event was designed to give new incoming students a head start on building relationships with classmates and professors, while also providing undecided students with a chance to visit campus, meet other students and faculty, and ask questions. Students met at the seminary for a picnic, lawn games, prize drawings, and root beer floats. Then the group headed to Target Field to watch the Minnesota Twins take on the Tampa Bay Devil Rays. Bethel Seminary’s various locations begin fall classes in late September. 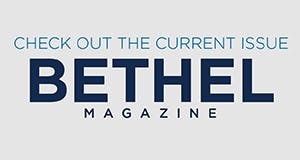 Bethel Seminary San Diego begins September 17; Bethel Seminary of the East starts September 20; and Bethel Seminary St. Paul kicks off September 24.